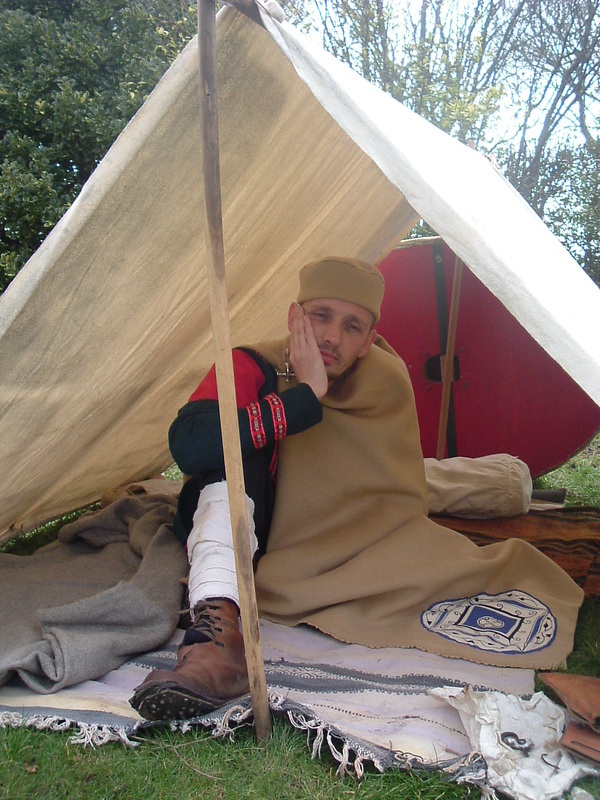 As a Late Roman re-enactor, I have been forced to ask the question: 'where did the troops sleep?' Of neccessity many re-enactment groups erect a Late Roman 'camp' dated to 400AD and it is layed out to resemble a Roman 'street' , with craft activities in progress, and with tents taking the place of houses. The first question is an easy one to answer, then, the legionaries lived in barracks within the fort. In fact at this date they may actually be living there with their families. Since I am camping, though, and taking on the role of a fourth century legionary, I wanted my tent to reflect that. I wanted it to actually be the type of tent a soldier would take with him into the field, rather than stand in as a dwelling or represent a substantial civilian tent. Many of Late Roman groups use tents that are very nice Saxon tents called 'getelds', which appear in our period (Late Roman to Early Saxon). Since I wanted to portray a military tent without that Saxon influence, I had to look at the fourth century military evidence. Firstly, if a legionary soldier of the limitanei has a nice bed with a mattress, and a barrack room to share with his family, why is he camping out on the moors? Away from the supply base, the soldier out on patrol, marching on campaign or on an extended foraging expedition would have had to supply himself, and carry along whatever tools he might need to survive. 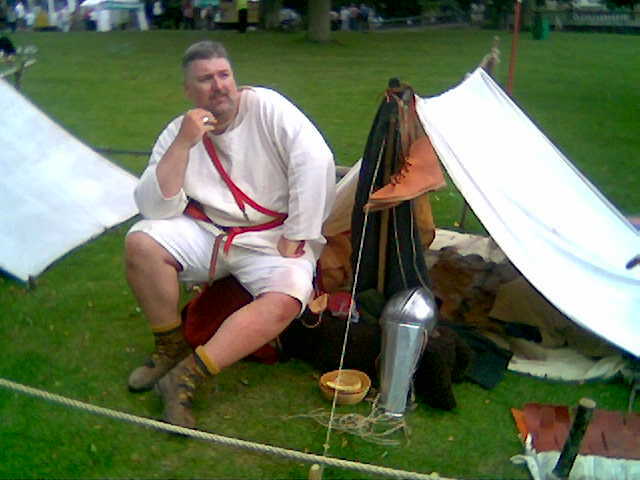 Life for the Roman infantryman outside of the fort lacked many of the luxuries that were all part and parcel of the job. Undoubtedly such hardships were never popular with the legionaries, even if the hardship lasted only a few days. Patrolling was a necessity for soldiers of the limitanei. As Rome's frontier troops, they were tasked with defending that frontier and always being aware of enemy activity beyond it. The deployment of small infantry patrols has been a standard information gathering tactic from Pharaonic times up to the modern age. A squad moves through occupied or disputed territories to gather information, scout out enemy activity, and attack its patrols. Meanwhile, aggressive patrols will set up ambushes, raid enemy camps, and seize prisoners for interrogation. Whether you are crossing the Rhine to patrol the German forests, marching along the caravan routes of Syria or hiking up into the Pennines, you and your squad are carrying out the same basic mission: look for trouble and report back when you find it. Historically, very small groups of infantrymen are used for patrolling so as to retain the element of surprise. It is because of this that patrols must be totally self-sufficient. This would imply that mules or packhorses will carry equipment and provisions for marches in excess of a week, and that wagons are always the preferred method of transporting food and equipment. A soldier carrying all his own kit, then, could expect to be out on patrol for several days, perhaps up to a week. What would a soldier carry with him? Late infantry soldiers always preferred to dump equipment in the wagons when on the march and it is unlikely that soldiers moving cross-country for several days without support would wear heavy armour. It is reasonable, however, to assume that frontier troops might carry out short patrols in full armour along roads. Troops of the Principate certainly did. For cross-country movement, battle-ready troops are forced to compromise their arms and armour. The Strategikon recommends that light infantry be used for patrols in rough or wooded terrain. They should discard helmets and mail coats, and they should carry small shields, short spears or short javelins, plumbatae and bows. It goes on to suggest they operate in groups of 3 or 4 armed with javelin and shield, with an archer to give them covering fire. By strange co-incidence, our expedition up Scafell Pike was made up of one archer and 3 infantrymen carrying small shield and either spiculum or short spear, exactly as described in the Strategikon. As far as I know we had arrived at our choice of weaponry through consideration of the terrain, not by analysing Maurice; but it shows that his precepts matched our living history experiences. A patrol would not carry a tent. We know from the archaeological record only of large, 3m square, leather tents used by soldiers of the Principate to accommodate a contubernium (10 man squad). Fragments of tent leather from Newstead and Birdoswald were calf, others from Valkenburg were of goatskin. Each tent of this type was made up of panels of leather stitched together using a waterproof stitching technique. Junkelmann's recreated goatskin tent weighed 28.5 kg (leather alone), and once the rope, poles and pegs were added, it came close to 40kg. Just the leather alone is a substantial burden for a man on the march. The squad tent is certainly something that goes in the baggage train. Even if such large squad tents were attributed to the Late period (although they are mentioned in literary sources many times), they are far too large to carry on foot. What of the 'field expedient shelter'? What did legionaries use for shelter when they weren't being followed by a baggage train? In many wars throughout history, the infantryman has had to find shelter where he could: in barns, ruined houses, under fallen trees, dug-outs or simply crouched up against a wall. Many armies have issued their soldier with tarpaulins/blankets which have served as an improvised shelter. Maurice recommends that cavalry "should take with them ... small tents or a couple of heavy cloaks, the one for covering if needed and the other as a tent or shelter..." (Strategikon 5.4) Referring to a number of modern wilderness survival books I discovered that a simple rectangle of cloth or canvas like this can be turned into a number of different shelter types. A single cloak, tied with string to a second, would make a very acceptable shelter cloth. One of the shelter types in the book caught my eye, two short poles tied where they cross, with a larger beam using the cross as a support. This beam slopes to the ground but provides the 'ridge' for a one-man shelter. I recreated this shelter with a single blanket (rather than two cloaks tied together), an 8ft spear (lancea) and two 3ft javelins (veruta). In the field expedient manner I used string tied to the corners as tent loops, and along each side I pushed a pebble under the blanket as an anchor and tied string around it to create the loop. Scavenged wood served as tent pegs, a stone as a hammer. Crawling in, I slept on my sagum. I used my oval shield (scutum) as a door to block off the entrance. It served well as a one-man shelter, suitable only for sleep, though! There was precious little space and the blanket (just like the cloak) didn't seem as if it would weather the rain too well.I later tried the same shelter with linen canvas 3m long by 1.8m wide. I had more headroom, plenty of spare canvas to fold under as a groundsheet, and a watertight weave. The canvas only weighed 2kg once rolled, and could have seen service with the legions. In fact, at Deurne, in the Netherlands, a single tarpaulin perhaps used for just such a purpose was discovered wrapped around several items of cavalryman's kit. This tarpaulin was probably carried by each individual cavalryman attached to his saddle. The Deurne tarpaulin is very poorly preserved, but was probably made up of sixteen goatskin panels (4x4) sewn together, size, in total, of 2.8m x 2.08m. Corner reinforcements were present, two of them with signs of a now lost fastening (perhaps a loop and toggle for joining together several 'individual' sheets into a bigger 'tent'). The piece was published by Carol van Driel-Murray ('A late Roman assemblage from Deurne (Netherlands)' in Bonner Jahrbuch 200 (2000) pp. 293-308) and provides a clue as to how the troops slept in the field. Goat or calfskin may have been cheaper than linen in ancient times, and perhaps easier to waterproof. Until I can create a leather tarpaulin after the Deurne example, I am going to have to continue to make my legionary patrol shelters out of a length of canvas. Using a larger piece of canvas (4m long by 2.8m wide) I also created a four-man ridge tent. 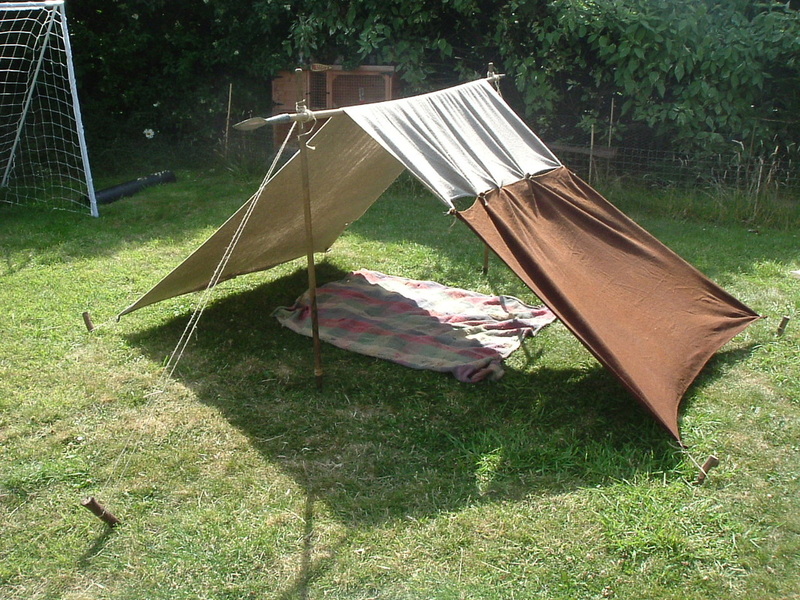 This was not idle speculation, but an attempt to recreate the only pictorial example of a Late Roman tent that we have. The illustration comes from the Vienna Genesis, a manuscript dated to the early sixth century. It shows a light-coloured canvas stretched over a central ridge which is held up by two shorter poles at each end. Like any ridge tent, the tension of the canvas keeps the tent upright. To maintain some of the 'field expedient' feel of the experiment I again used the pebble and string method to create tent loops (rather than sew some on) and timbers scavenged from the woods for the poles. Again, my tent pegs were made from scavenged wood. My recreation perfectly mirrored the Vienna Genesis shelter, though whether it was for civilian or military use we do not know. Probably it was a design used by everyone. Federal troops in the American Civil War were using an identical design nicknamed the 'dog tent' or 'pup tent'. The lack of doors of any kind reflects its improvised nature, but it is roomy and comfortable. A blanket or a skin is required as a groundsheet, and at night for privacy or during rain or wind, I erect screens at either end. A blanket can be thrown over the entrance and tied on with string, and a sagum can be tied between two javelins at the other end. 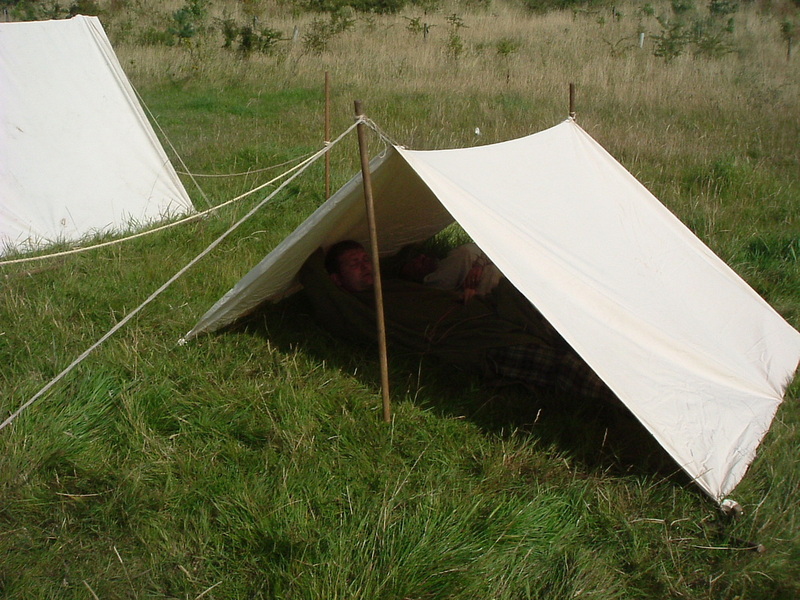 I tested this shelter at the Festival of History at Kelmarsh Hall (13/14th August 2005) in high winds and torrential downpours. Both my kit and I stayed dry and warm, but as the canvas got wet it stretched and several times the ridge pole slid over, until I secured it with a couple of guy lines. The tent pegs also needed repositioning to take the stretch into account. In all a successful experiment! It shows that the Vienna Genesis shelter is viable. Without any pictorial or archaeological evidence to show that Late Roman troops continued to use the elaborate eight-man tents of earlier periods, I suspect that a shelter like the one on the Vienna Genesis served the fourth century legionary instead. Fitting trends in the Late Roman army, it was cheap and effective. 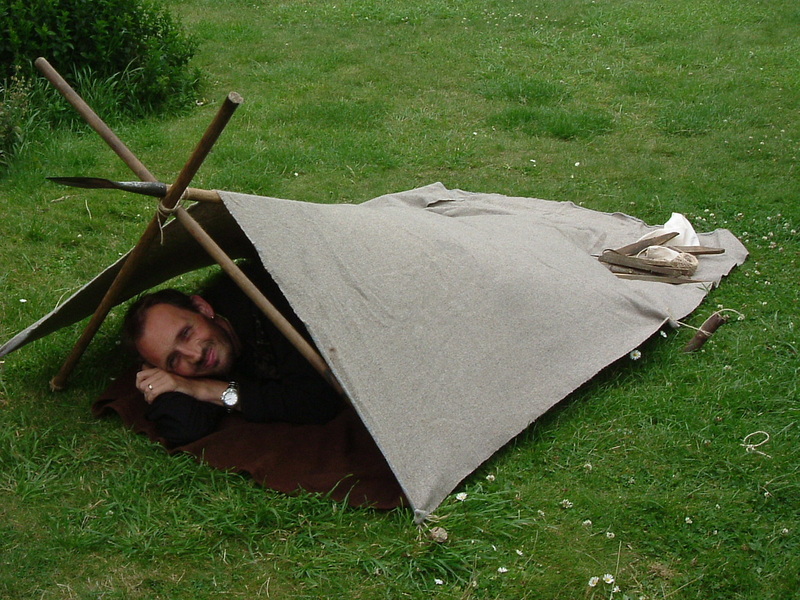 Today all the Earlyworks members use this Vienna Genesis ridge tent, as do the members of the Late Roman re-enactment group Comitatus, where I introduced my tent design during my tenure as secretary there. Five years on the Comitatus group continue to use my ridge tent design! 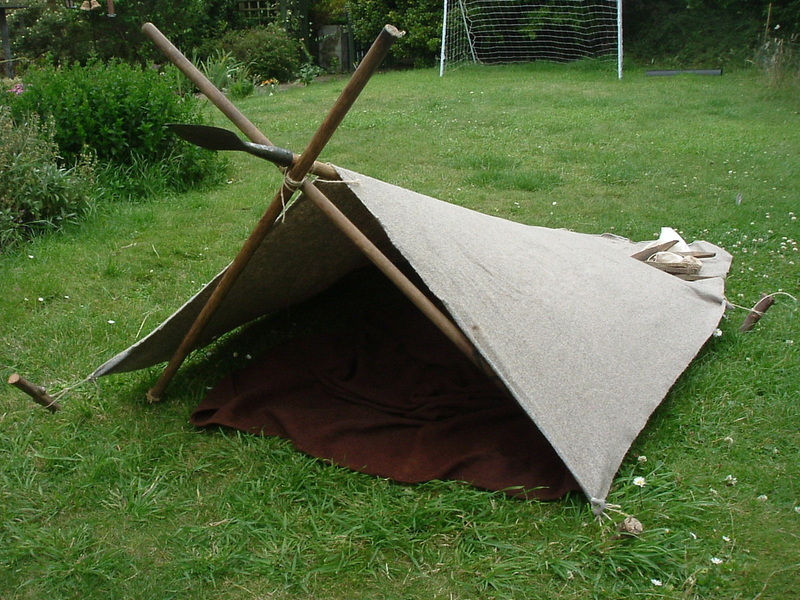 The ridge tent design has been so successful that I went back to Maurice's advice on using cloaks to create an improvised shelter, and I recreated a ridge tent using spear and javelins. Two cloaks tied together, thrown over a spear held up by two veruta, pegged out with scavenged wood as before... created a great two man tent. This combined the literary evidence from Maurice with the pictorial evidence from the Vienna Genesis and is the shelter I am most happiest with. Whether I want to spend rainy weekends under this improvised ridge tent, I am not so sure! 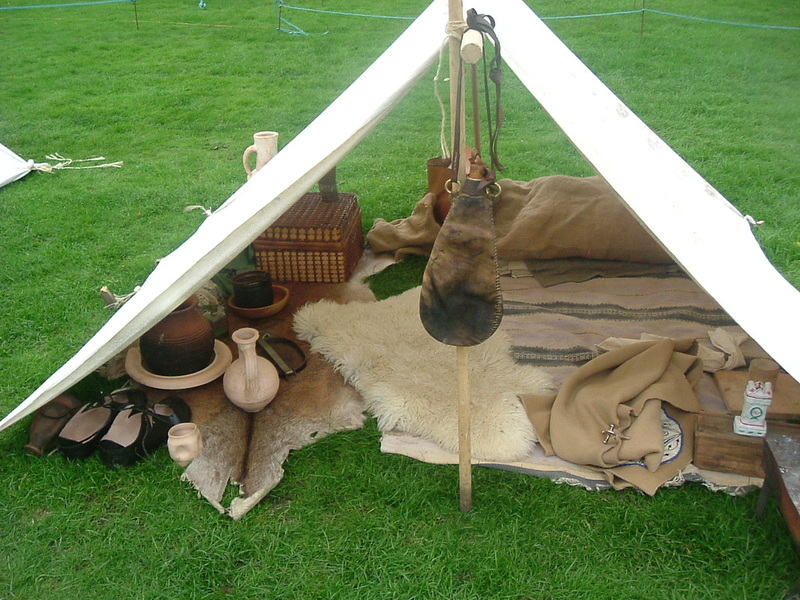 But it will be nice to set it up next to the four-man ridge tent, to show the public what a fourth century legionary might well have used in the field or on his way to war. It follows the tenet of the infantryman in all eras of history - 'adapt what you have to survive'. Using your weaponry, shield and cloak to create your overnight bivouac fits well with the timeless military reality of the fighting man.